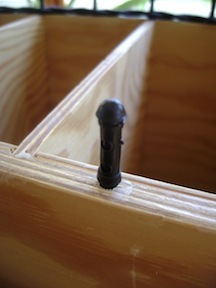 All Sonor xylophones and metallophones use rubber pins (ZS1 or ZS2) to mount the tone bars onto the resonator box. Over many years of use, individual pins can break or wear out, and will need to be replaced. Here we show 2 methods to remove the old pins, and illustrate how to install the new ones. From my work in the field, I have seen how important it is to replace broken rubber pins with authentic Sonor parts, and to do this work with care and attention to detail. Please do not be tempted to pound a metal nail through the center of a broken off rubber pin. This often results in damage to the resonator box, and when this happens you have a far more difficult problem to solve. When the rubber pins are replaced with rubber, you extend the life of the instrument, and you protect your investment for years to come. Please note: The process for replacing Studio 49 rubber pins is similar, but somewhat different from the Sonor pin replacement process. 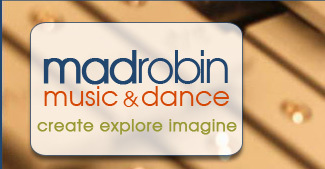 Please contact Margaret for details, or wait for our Studio 49 Rubber Pin replacement blog coming soon. Pin Removal Method 1: This method is for when you have at least 1/8 inch of the pin sticking out of the hole. You will need a pair of vise grip pliers. Long nose vise grip pliers work the best. Also you will need a small thin piece of metal to serve as a pry guard. Never pry on the wood of the resonator box or it will be damaged. Always begin your repair projects by wearing eye protection. 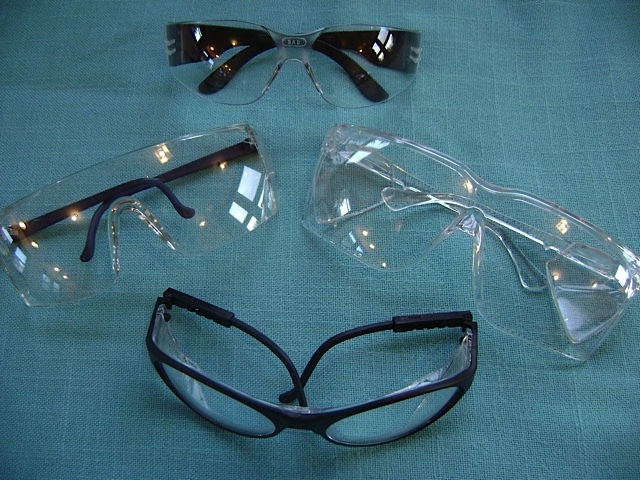 Inexpensive safety glasses can be purchased at any hardware store. 1. 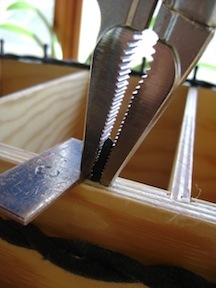 Set the vise grip pliers so they will tighten around the pin, but not cut through it. Use trial and error to determine the setting. Photo shows position before gripping the pin. 2. 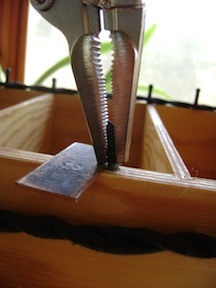 Grip the pin and rock the pliers to one side, then slide the pry guard under the pliers and close to the pin. 3. Rock the pliers back, with all pressure going on the pry guard, to start to budge the pin out of its hole. 4. As pin starts to come out, re-set the vise grip pliers, and the pry guard, to repeat steps 1-3 until the pin comes all the way out. Now scroll down to Installing the New Pin. Pin Removal Method 2: This is for when the pin has broken off flush with the resonator box, or has less than 1/8 inch sticking out. For this method you need a either a hand drill or a power screw driver fitted with a drill chuck. I prefer this over a full sized power drill because it gives you more control and the ability to stop before you make a mistake. 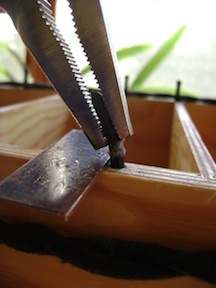 You may also want to have a pin vise for the final sizing of the hole. 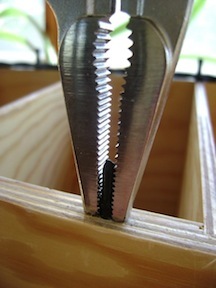 The Pin Vise is a handle that holds the drill bit, see picture to right. You turn it manually. 1. Use a knife or single edged razor blade to cut off any remaining portion of pin. Don’t cut yourself. 2. 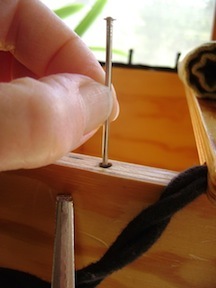 Mark the exact center of the broken pin by tapping a small nail into it, enough to make a depression. Remove the nail. 4. Rotate the drill bit clockwise a short distance into the rubber pin. 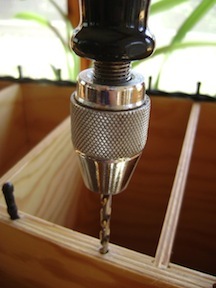 Try to center the drill as accurately as you can. A thread of pulverized rubber will start coming out of the hole. Keep drilling until you reach the desired depth, or until you encounter resistance. 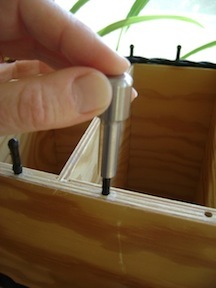 You must drill straight down, otherwise you could put a hole through the side of the resonator box. 5. 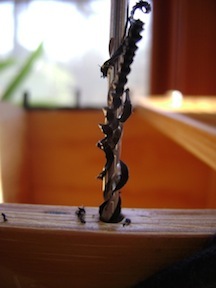 Remove the drill bit by continuing to turn clockwise while pulling up on the drill. 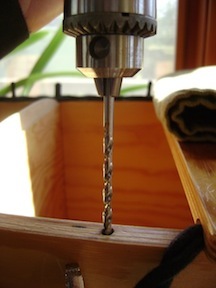 Vacuum the rubber and glue bits out of the hole and remove any rubber and or sawdust from the drill bit. 1. Carefully enlarge the hole with the 11/64th drill. This will be your finish size. If you have drills #1-60, use drill bit #18. If the hole is still too small, use the 11/64th inch drill bit again. Human variation will cause a little bit more material to come out. 2. After vacuuming the hole, insert the new pin. This photo shows the pin insertion tool we sell that helps you install the pin for a press fit, without bending it. 3. The new rubber pin should fit tightly and not come out when you pull up on it. 4. 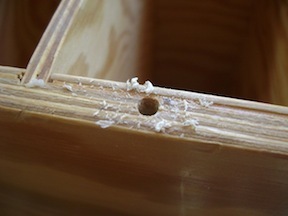 If the hole is too large, place a drop of wood glue in the hole and a little around the perimeter of the hole. In addition to the Sonor pin replacement methods I've described above, there are 2 videos on YouTube that demonstrate alternative methods for accomplishing this repair. Video #1 is from Sonor. Video #2 is from West Music. 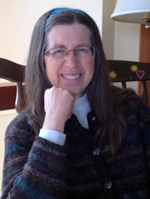 The method you choose will depend on the tools you have available and your comfort level in using these tools. Be sure to use EYE PROTECTION whenever using tools. For Sonor Meisterklasse, Primary Line, and Global Beat Sucupira wood, choose rubber pin ZS1. For Sonor Global Beat Fiberglass, and Global Beat Metallophones, choose rubber pin ZS2.